With technological advancement, people have started to look for cheap yet reliable solutions for buildings. The old days are gone, where countless number hours of sweat and money were spent on building structures. According to a survey conducted on over 800 engineering and contracting professionals, 65% reported decreasing cost with 77% reduction in construction waste. Prefabrication construction have been used since ages, but now, whether it is a guard shack, ticket booth or any other modular office, systems of the 21st century have enabled manufacturers to build and deliver high- quality offices, straight to the location. Panel built is one of the most trusted names in the industry, delivering high-quality structures. Large businesses have enough resources and leverage, but smaller and medium-sized businesses need a smarter and less costly approach to construction which helps them to diversify as per need. Such business need flexible solutions that enhance the capabilities of employees and allows them to reconfigure as they evolve. What purposes can a Portable Guard Shack fulfill? Panel built offers prefabricated guard shacks which are the most rugged and well-built guard house available in the market. Keeping in mind the level of outdoor abuse these booths will receive, Panel Built only uses high-end products that last. Guard Shack is also known as guard booth or guard enclosure so if you are buying your product online, do not confuse yourself with the varying names used. There is a variety of shapes and sizes you can choose from, depending on customer requirements. Machine or Equipment Enclosures: These outdoor booths can be used to store or use machine and equipment’s which require shelter from heat, dust or sunlight. Panel built has used world class technology to make sure all the booths stay up to the mark. Not only these booths provide shade, they also insulate external noise. With electrical outlets provided, internal equipment’s can be easily plugged for use immediate use. Material Storage Models: Guard shack enclosure can be used to store supplies or inventories too. As the model provides insulation and prevention from heat and sunlight, it can easily be used for storage purposes. Consultant Space: Due to the quality and material used by Panel Built, our booths can be used for consultation purposes too in construction type setting. A lot of our customers come from industrial setting, looking for quick and easy to set-up space and our booth allows them to efficiently use space for meetings or other project conversations. Lookout/Observation Towers: Panel built products are extremely versatile and light weight as we make these booths using aluminum and other quality products. This is why it can easily be transported or placed above buildings or any other remote areas for a lookout. The booth provides a 360-degree view, allowing the security personnel to keep a watch all around. Attendant Cubicles: Guard enclosure booths are also used as attendant cubicles by many companies which provide a focal point for their customers and visitors.They can further be used to handle cash dealing, identity screening and even as a waiting area for visitors. The cubicle also allows to install other additional trays such as ticketing, cash collection or transaction windows. 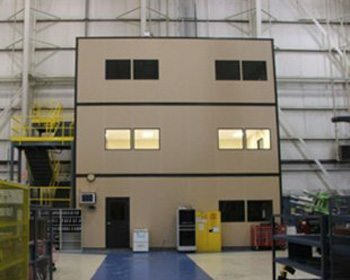 Guard Houses as well as in-plant Offices: Pre-assembled booths can not only serve as guard houses but can be used indoor as an in-plant office. The booth allows air conditioning units to be installed. It is an ideal office space for an industrial plant setting as it easily seals off heat and noise. Easy to order: With an online presence, you can now order a prefab guard by calling and speaking to one of our representatives. Panel Built has a service center in almost every state. If you need a one on one session you can visit an outlet near you and we will help you with your requirements. Quick shipment: With our quality human resource and integrated systems, expedited shipment is done to make sure our clients get the product as soon as they finalize their choice. Lightweight and Portable: Due to the materials and technology used in making these booths, they are extremely light in weight yet versatile. These booths can easily be moved from one place to another by a fork lifter and they come with a forklift pocket. Guard shacks can even be placed in rooftops for a 360-degree view. Assembling is not required: Prefabricated booths are always the best choice for an onsite construction. It does not require any installation and can be kept almost anywhere. These booths also have inbuilt electrical outlets and switches so installation is not required. Apart from the versatility the booths have, Panel built products offer unlimited options, which can create a functional booth, rather than just a shade. Our Guard shacks allow customizing the exterior of the booth so that it complements the surroundings.